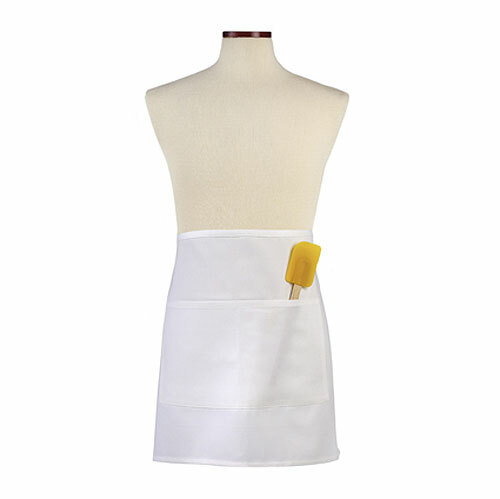 This 28" x 19" white half bistro waist apron is larger than a waist apron but shorter than a bistro, this apron with two divided front center pockets fits right in with comfort and function. This half bistro waist apron measures 28" x 19" and is 65/35 poly/cotton twill with generous 40" ties. It is ideal for any job! Customize with a company logo or event name with embroidery, laser or screen print. Imprint are on the pocket is 4" x 4". Add our ties and scarves to complete your uniform. Half length bistro style waist apron made of a 65/35 polyester/cotton twill. Front pocket divided into three sections. Extra long waist ties. Embroidery and screen printing available - 2" x 8" imprint area above pocket, 3.5" x 6" imprint area on pocket. In stock and ready to ship. 12 piece minimum. Quantity discounts available. Individually poly bagged.